The name Calderara comes from the local "calderai" (boilermakers). Calderara stretches along the left bank of the Reno, at the centre of a territory already occupied by the Romans at the time of the Republic. Archaeological remains from the Roman period, found during excavations of ancient farmhouses and wells in the area, are exhibited in the Archaeological Environment Museum open every Sunday. In 43BC, a momentous event in history happened here. Sacerno is indicated as the site where, after the death of Julius Caesar, Octavian, Mark Anthony and Lepidus divided up the Roman world with the Second Triumvirate. 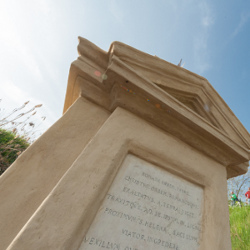 The site is today indicated by a Baroque period column that has been recently restored and is located on the banks of the River Lavino. The importance of Sacerno, however, dates back to even more ancient times. Also known in the past as Mezzomondo, up to the 16th century the area was known as San Chierno, a name deriving from the Celtic Kernunnos, the horned god associated with rivers and the centre of the world. In the Christian era, in the 8th century, the nearby proto-romantic rotunda of Sant'Elena was built to consecrate a site that had already been sacred to other cults. The remains of the ancient Church are now part of the highly original bell-tower of the successive Benedictine parish church. Among the beautiful villas and country houses in the territory, of particular note are Villa Tanara (17th century) and Villa Donini, with a park created at the end of the 19th century by the Count of Sambuy, responsible for Villa Magnani in Zola Predosa as well. Also worth visiting is the complex of the Church of San Vitale in Longara, the summer residence of Cardinal Lambertini, later to become Pope Benedict XIV. In Tavernelle Emilia, it is impossible not to note the large, and now precarious, mass of Villa Paleotti Spalletti, the rear of which faces onto the Persicetana highway. Built in the 17th century by the Paleotti family, in 1682 it passed into the hands of the traders, the Zagnoni, who obtained permission to use the lawn in front of the villa for an important fair in September. Calderara di Reno is a member of the National Association of "Wine Cities".